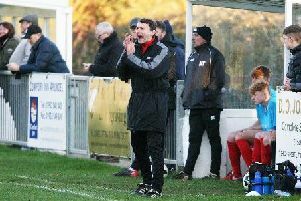 East Preston needed extra-time to overcome SCFL Premier Division rivals Loxwood in what turned out to be a thrilling Sussex RUR Cup encounter. Defender Tom Lyne got the decisive goal after 97 minutes with EP running out 3-2 winners in the second round clash at The Lashmar last night. Goals either side of the break from Asa Nicholson and Cian Tilley had put East Preston 2-0 ahead and seemingly on their way to round three with ease. However Loxwood had other ideas and efforts from Michael Wood and Tom Frankland in the space of seven second half minutes forced extra-time. Magpies would have fancied their chances of progressing now, but it was Bob Paine’s team who would get through eventually. Lyne was on hand to head home after 97 minutes as the home side edged a five-goal thriller. Nicholson netted his first East Preston goal on the half-hour as the home side held a slender 1-0 advantage at the interval. Forward Tilley seemed to have sent EP through after doubling their lead two minutes after the restart. Wood pulled one back for Loxwood 25 minutes from time then Frankland made it 2-2 seven minutes later. Both teams had chances to win it in normal time but neither found a way through and extra-time followed. Defender Lyne would win it for East Preston on 97 minutes to send Paine’s side through. Loxwood had a man sent off late on as their frustrations boiled over. East Preston return to league action on Saturday as they make the trip to Lingfield.